Article received on the 5th of February 2013. Article accepted on the 18th of February 2013. Maria-Magdalena Gurzun, MD, “Prof. Dr. C. C. Iliescu” Emergency Institute of Cardiovascular Diseases, 258 Fundeni Street, District no. 2, 022328, Bucharest, Romania. Tel./Fax +4021 317 52 27. E-mail: magdalenagurzun@gmail.com. Cardiac rupture is a well known and feared mechanical complication of myocardial infarction. It is diagnosed in approximately 4% of myocardial infarctions and is the second most common cause of in-hospital mortality in this patient population1. Contrary to widely held medical belief, myocardial rupture is not always a fatal condition2. 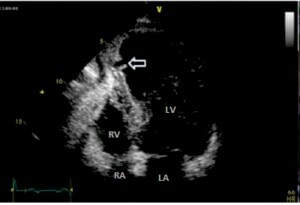 A 59 year old man with a recent history of non-revascularized anterior myocardial infarction was admitted for exertional chest pain. Transthoracic echocardiography showed extensive left ventricular (LV) regional wall motion abnormalities, mainly in the left anterior descending artery territory (akinesis of the anterior wall, apex, anterior septum and apical segments of the lateral and inferior walls) with severe LV global systolic dysfunction and no pericardial effusion. The apical anterior septum presented a small gap in the endocardium extending toward the epicardium (Figure 1). The defect appeared to be contained within the myocardium and did not involve the whole wall thickness (Figure 2). Contrast echocardiography (SonoVue, Bracco) demonstrated the absence of communication with the pericardial sac or with the right ventricle (Figure 3), suggesting an incomplete rupture of the LV myocardial wall. Figure 1. Transthoracic echocardiography, four-chamber view – discontinuity of the endocardium extending toward the epicardial layer (arrow); [LV – left ventricle, LA – left atrium, RV – right ventricle, RA – right atrium]. Figure 2. Transthoracic echocardiography, modified four chamber view –a defect measuring 1cm that communicates with the left ventricle cavity through a narrow neck. The defect appears to be circumscribed within theventricular wall; [LV – left ventricle, AO – aorta]. Figure 3. 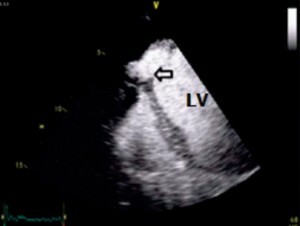 Contrast transthoracic echocardiography – the LV cavity is completely opacified but there are no bubbles in the pericardial space, demonstratingthe lack of communication; an intact myocardium layer is present at the tip of the defect; [LV – left ventricle]. Coronary angiography showed occlusion of the left anterior descending coronary artery and a 90% stenosis of the right coronary artery in the mid segment. Serial echocardiograms performed during the first week showed that the rupture did not progress to an interventricular communication or a ventricular pseudoaneurysm. Surgical treatment was denied by the patient. After seven months the patient was clinically stable, without angina or heart failure on optimal medical treatment. 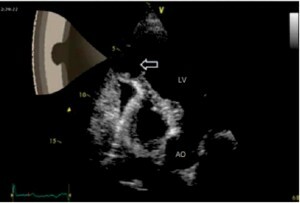 Transthoracic echocardiography showed a hyperechogenic area replacing the discontinuity observed before and a large thrombus covering this area (Figure 4). Figure 4. 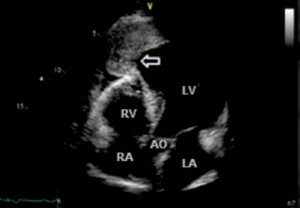 Transthoracic echocardiography after 7 months, five chamber view– hyperechogenic area replacing the discontinuity observed before and alarge apical thrombus covering the previous pseudo-pseudoaneurysm; [LV – left ventricle, LA – left atrium, RV – right ventricle, RA – right atrium, AO – aorta]. Morphologically, four patterns of myocardial rupture have been described1,3. Type I and type II represent complete myocardial rupture with either linear or multicanalicular trajectory with devastating haemodynamic consequences; emergent surgical treatment is man­­datory in these cases. In type III (pseudoaneury­sm), the orifice of rupture is protected by thrombus on the ventricular side or pericardial symphysis; surgical treatment is indicated4. In type IV (pseudo-pseudoaneurysm) the trajectory does not extend through all layers and is therefore not transparietal; the rupture remains circumscribed within the ventricular wall itself but in communication with the ventricular cavity; the natural course and the optimal management is not clear because there are only few cases reported4. Both type III and type IV ruptures are often grouped together as incomplete myocardial rupture5. Lack of communication with the pericardium and echocardiographic appearence of an intact myocardial layer suggested that pseudo-pseudoaneurym is the most likely diagnosis in our case. For confirmation a cardiac magnetic resonance study would have been useful. Contrast echocardiography seems to be an alternative method for the early diagnosis of myocardial rupture providing quick information regarding the rupture type: complete (i.e. emergent surgery is mandatory) or incomplete (i.e. surgery may be delayed)6,7. The take home message of this case is that conservative management of pseudo-pseudoaneurym with close clinical and echocardiographic follow up may be considered in asymptomatic patients with high surgical risk. 1. Sutherland FW, Guell FJ, Pathi VL, Naik SK. “Postinfarction ventricular free wall rupture: strategies for diagnosis and treatment.” Ann Thorac Surg 1996: Apr;61(4):1281-5. 3. Perdigao C, Andrade A, Ribeiro C. “Cardiac rupture in acute myocardial infarction. Various clinico-anatomical types in 42 recent cases observed over a period of 30 months”. Arch Mal Coeur Vaiss 1987: Mar;80(3):336-44. 4. Gollol-Raju N, Olearczyk B, Johnson R. “Pseudo-pseudoaneurysm: a rare and unexplored mechanical complication of myocardial infarction”. J Am Soc Echocardiogr 2007: Nov; 20(11):1317. 5. Helmy TA, Nicholson WJ, Lick S, Uretsky BF. “Contained myocardial rupture: a variant linking complete and incomplete rupture”. Heart 2005: Feb;91(2):e13. 7. Ishida T, Yasu T, Arao K, Kawakami M, Saito M. “Bedside diagnosis of cardiac rupture by contrast echocardiography”. Circulation 2005: Dec:13;112(24):e354-5.